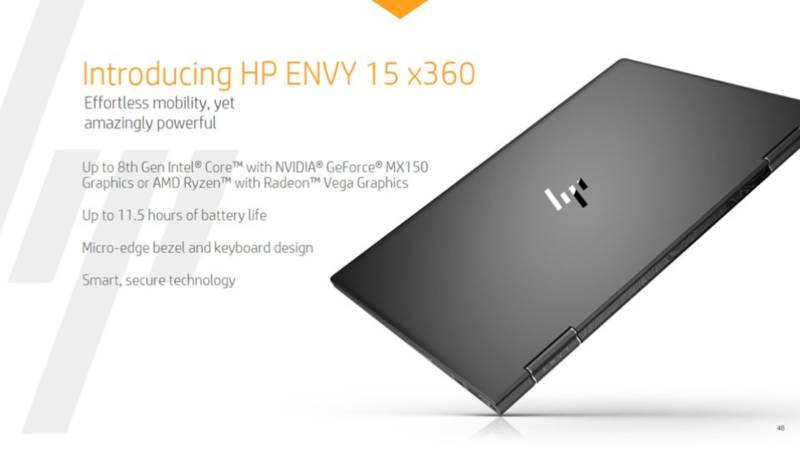 HP has announced refreshes to its Envy notebook lineup including the Envy 13, Envy 17, Envy x360 13, and Envy x360 15. The standout feature of these notebooks is the new minimalist chiseled appearance similar to the patterning found in sword blades made from Damascus steel. 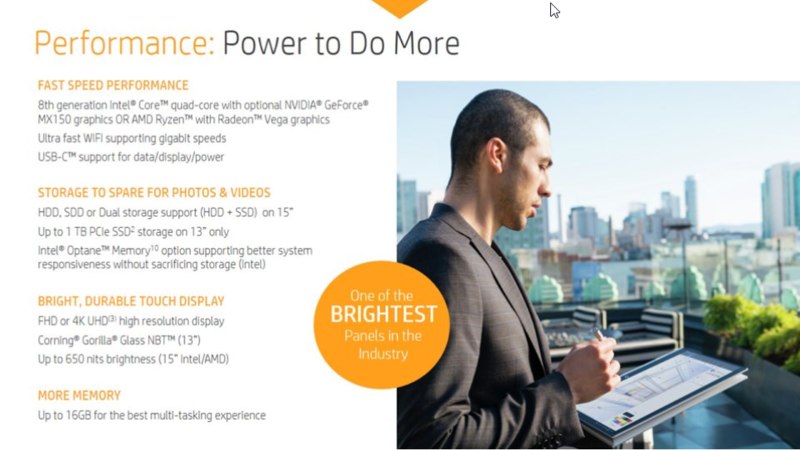 Internally, all notebooks receive an upgrade to the Intel 8th generation CPUs with the Envy x360 offering AMD Ryzen with Vega graphics options as well. The Envy x360 15 also sports a 650-nit bright panel for excellent outdoor legibility. Similar to the Pavilion notebook refreshes we saw last month, HP has announced that it is refreshing its Envy notebook lineup today. The new Envy notebooks feature up to a 31% thinner top bezel, a new geometric patterned speaker grill, and a new Damascus steel patterning on the base of the lid. 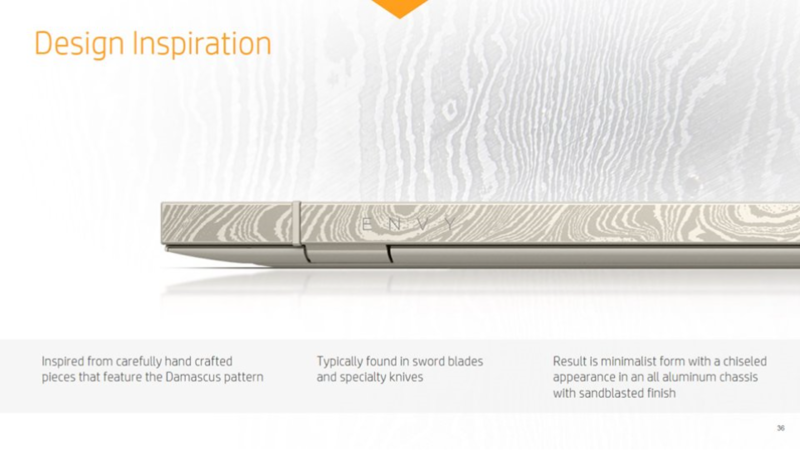 HP says that the Damascus steel patterning results in a minimalist chiseled appearance in an all aluminum chassis with sandblasted finish. The refreshed Envy notebook lineup consists of the Envy 13, Envy 17, Envy x360 13, and the Envy x360 15. The Envy 13 and 17 come with upgraded internals such as an Intel 8th generation CPU, NVIDIA GeForce MX150 graphics, and Gigabit Wi-Fi. 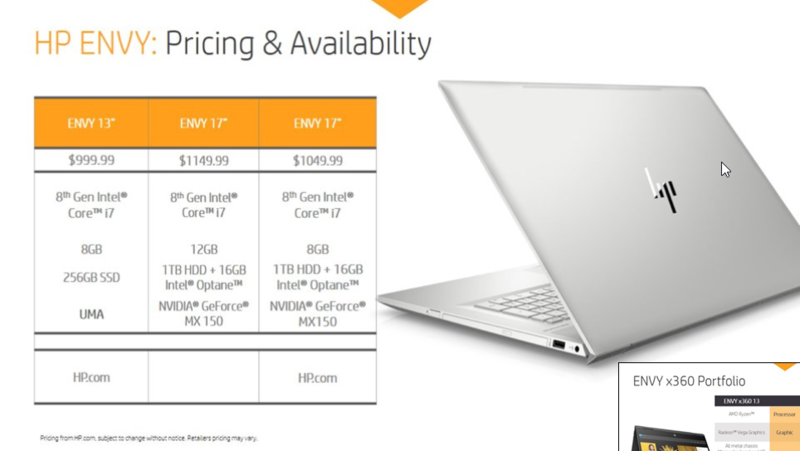 The 17-inch version comes with dual SSD/HDD storage options along with support for Intel Optane while the 13-inch variant can be configured with up to 1 TB PCIe SSD storage. Both models support up to 16 GB RAM. HP is including a new HP Command Center software that can be used to configure the thermal profile of the notebook. Command Center offers a recommended mode alongside Performance, Cool, and Quite modes for varying requirements of CPU and GPU performance. Both 13 and 17-inch variants offer the choice of an FHD or 4K display. The 13-inch model offers a Corning Gorilla Glass protection and an optional touch display as well. The quad-speaker setup plays back Bang & Olufsen-tuned audio — a characteristic HP feature. HP claims the Envy notebooks can offer up to 14 hours of battery life and if you happen to run out of juice quickly, HP Fast Charging can top up 50% of the battery in 45 minutes. 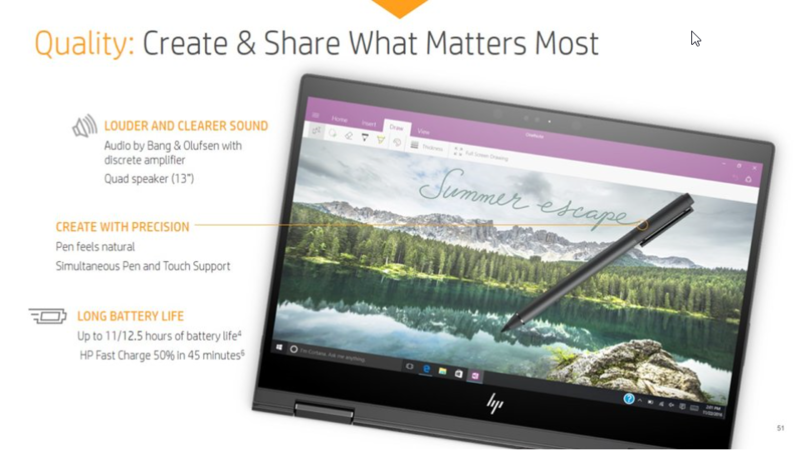 Select 13-inch models also feature HP Sure View that protects confidential data from visual hacking and an easy to use privacy mode toggle. 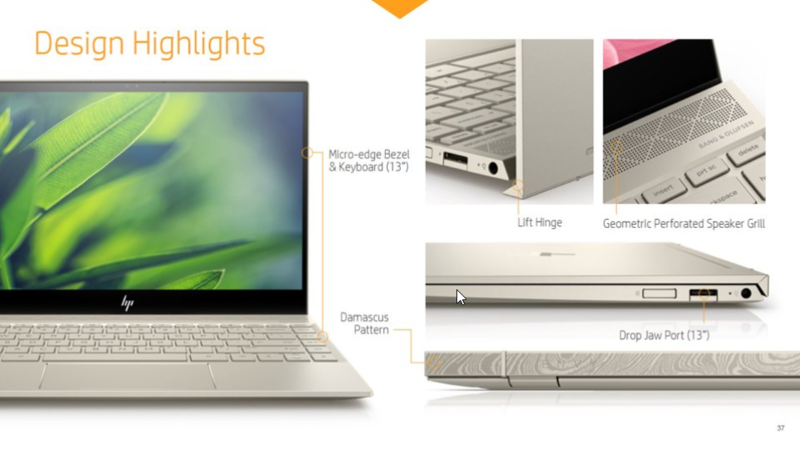 On both the laptops, the Windows Hello-compliant fingerprint reader is located on the side power button. HP has managed to retain the slimness of the 13-inch variant and still offer a legacy USB-A port by implementing a Drop Jaw Port. 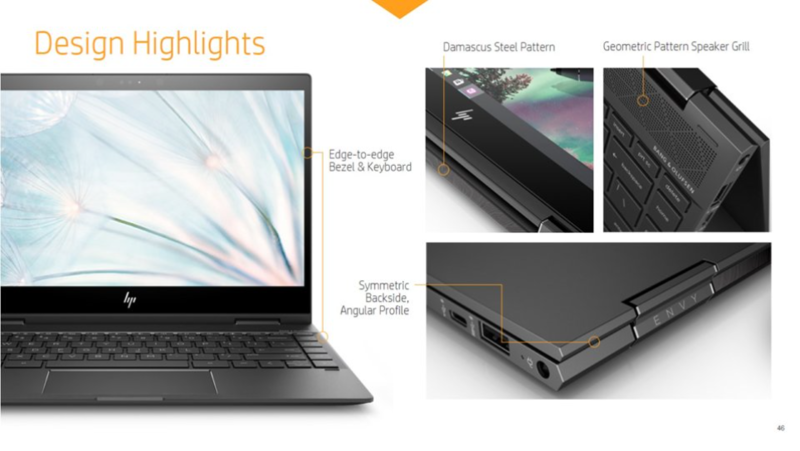 Pricing starts from US$999 for the Envy 13 and goes up to US$1,149.99 for the Core i7 17-inch with 12 GB RAM, 1 TB HDD, GeForce MX150, and 16 GB Intel Optane. The Envy x360 convertibles also sport similar design choices like the Envy notebooks with slimmer bezels, geometric pattern speaker grill, Damascus steel pattern, and a symmetric angular back. 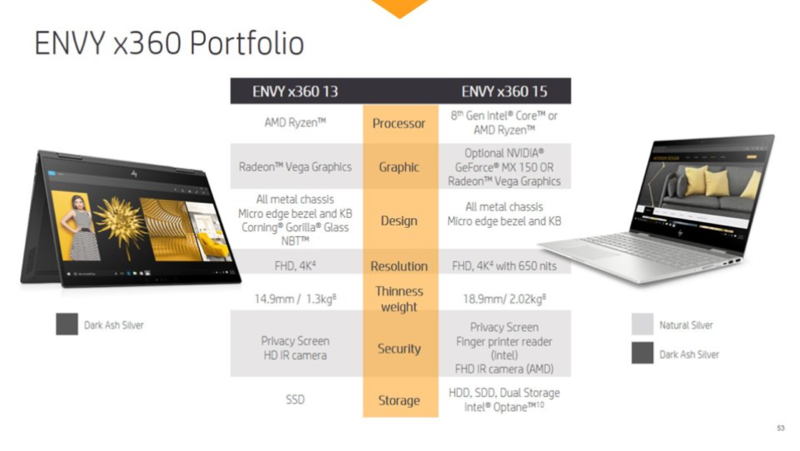 The Envy x360 comes in 13 and 15-inch variants. 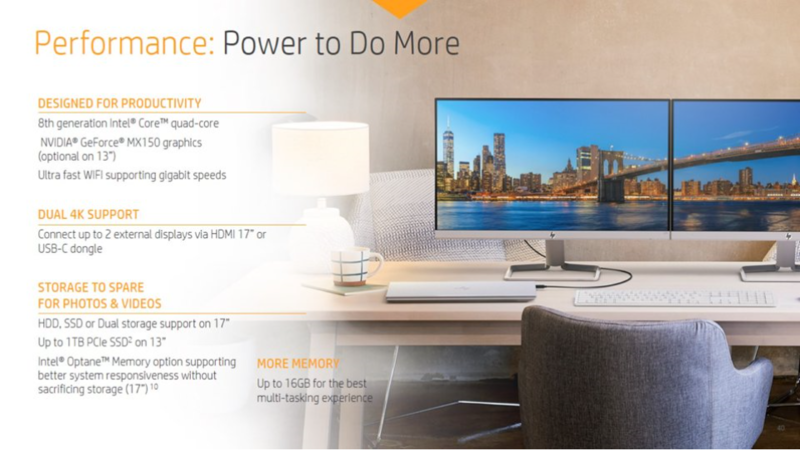 Both the convertibles are offered with a choice of an Intel 8th generation CPU with NVIDIA GeForce MX150 or an AMD Ryzen APU with integrated Radeon Vega graphics. The 15-inch x360 has both SSD and HDD options with support for Intel Optane while the 13-inch offers up to 1 TB of PCIe SSD storage. While both the Envy x360s are offered in FHD and 4K display options, the 15-inch x360 has a screen brightness of up to 650-nits making it great for outdoor work in bright sunlight. Up to 16 GB RAM can be configured on both the systems. Being a convertible, the Envy x360 has pen and touch support although, we are not quite sure if the pen supports tilting. Battery life can be expected to be north of 11 hours and the battery can be charged up to 50% in 45 minutes courtesy of HP Fast Charging. The Envy x360 convertibles also sport the same privacy features as the Envy notebooks such as a privacy screen and an IR camera for Windows Hello. The 15-inch Intel version has a fingerprint reader in lieu of the IR camera on the AMD variant.